Steven Freeman is an author to pay attention to. 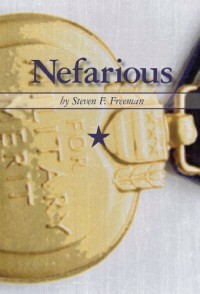 Nefarious is one of those books that grips you from the very first chapter. It was a fast paced book filled with lots of action. I can't say there was a dull moment in this book. I wouldn't say that I am typically drawn to war stories, yet I really liked this book. Even though it was a little out of my typical tastes. I believe that this book would make a great movie. In my personal opinion I think that there was too much military scheming and not enough science. It was clear through reading that the author had a military background and therefore the story felt rather realistic. It was obviously very well researched, which I can definitely appreciate. I would have liked to have gotten better descriptions of the characters, I feel like I only have a vague idea of what they looked like.